I am writing at the weekend after the huge market shock and currency shock of the Brexit vote in the UK. The shock was particularly strong as markets had priced in a Remain vote. This was to be expected. Many commentators have pointed out that the vote would have an equally negative effect on Europe itself, and indeed the German DAX, the French CAC, and Spanish IBEX and Italian MIB markets also fell sharply. You would also expect the EURUSD itself to fall, but not as much as GBPUSD, and indeed this was the case. In fact it only fell by a quarter as much, but this because USD also fell. 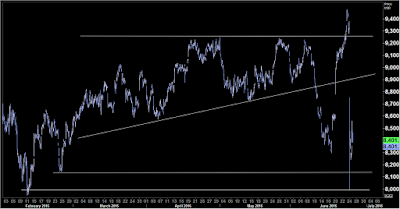 This can be seen in the much larger moves in JPY pairs. Very bad timing for holidaymakers – we are one week into summer, and EURGBP rose over five pence, or as we British traders are always having to explain to our holidaymaking friends that we quote it the other way round in the business, and do a quick 1/rate on the calculator, your rate has dropped from €1.31 to €1.23. Here is the currency movement for July 24th. The first column is midnight, before the results. This morning, I read in the Daily Mail, a right-wing pro-Brexit newspaper that the FTSE had recovered three quarters of it’s losses whereas the European markets still languished with huge losses, implying the strength of UK Plc, against the dastardly foreigners over whom we are so keen to demonstrate our superiority. 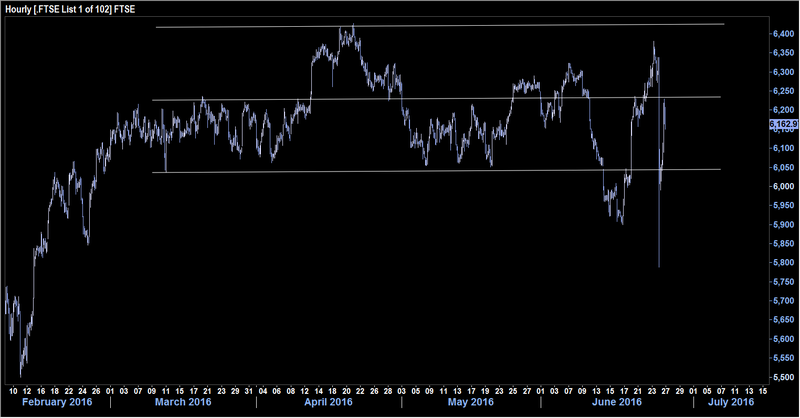 Here is the chart of the FTSE running up to Brexit, and of course the chart at first glance confirms the story. The FTSE is running in a nice even range, and has settled back exactly at the middle of the range. Considering we are seven weeks into the famous ‘Sell in May’ doctrine, things are looking fairly good for a long-term investor. Or are they? There is a fatal flaw in that argument. The FTSE index is denominated in GBP, just like it’s constituent shares. That means one FTSE contract, on Friday’s close is worth £6,139. 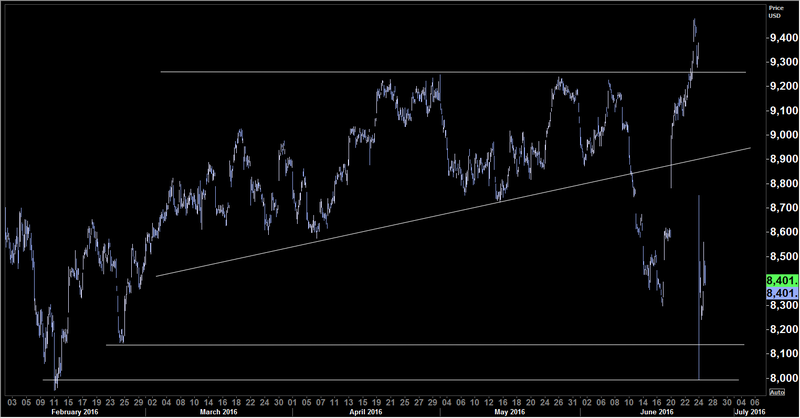 But now let’s look at a second chart, the FTSE expressed in USD. This tells a very different story. The technicals here show anything but an even range, ruining completely a well-formed ascending triangle. 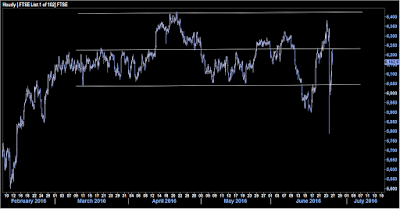 The panic spike went through the Feb 25 low (the date that the referendum date was announced, and Boris Johnson declared for Brexit), and nearly touched the Feb 11 low, only being held by the three-zero roundpoint of 8,000. Is this a real instrument. 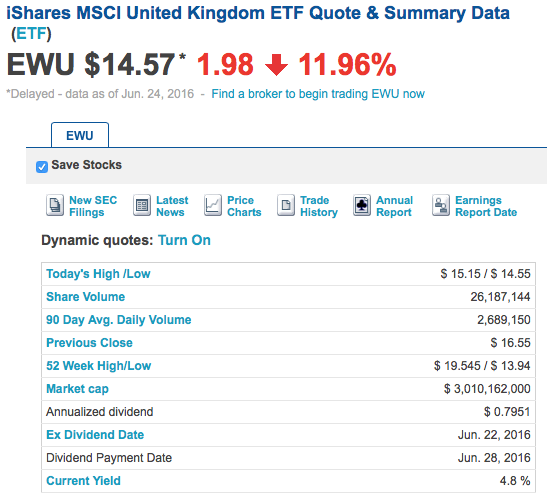 Well in simple terms, yes, there is an ETF called iShares MSCI United Kingdom (NYSE:EWU) which trades during US hours. It has a few extra components (123 shares), and so the FTSE in dollars chart is almost but not exactly identical to EWU, and here is the nasdaq.com page for the instrument on Friday. A drop of 12%. In other words, approximately the GBPUSD loss added to the FTSE loss. Note also the volume on EWU on Friday, nearly ten times the average. But in a wider sense, as the overwhelming volume of investment capital in the world is denominated in USD, it doesn’t matter what currency people use to buy an instrument, if they are converting from USD to do so, then the risk is effectively a USD risk. I could now show the above table, using EWG – DAX in dollars, EWP – IBEX in dollars, and EWQ – CAC in dollars. But a simpler method is just to add the market losses to the currency losses. I am using the first and third columns of the tables above. This is called currency correlation and there is a theme here that traders can benefit from. When you see a blind panic, as we saw in the early hours of July 24th, and on the US Open Bell of August 24th 2015, look for non-USD instruments which are spiking down, along with the currency. They can’t both continue, and it will usually be the index that recovers first. If you are a British investor, and had bought the FTSE daily future on Friday’s 0700 open, you would have banked 346 points or 16.74% – in one day, before leverage. (You would have to have got out at 1630, the future declined by 2.31% in remaining US session to 2100). A dollar trader would have gained even more, as GBP actually strengthened by 0.64% (8.63-7.99) during the day. This raises a wider issue of which currency you feel you are domiciled in. The answer is seems simple, if you live in London it’s GBP, in Lisbon EUR, and in LA USD. (Although even that is not right, as Brits will find shortly when they try to buy Mercedes cars or Apple computers at the same price as pre-Brexit). But I’m talking about where your investments are. If you buy US shares or US share CFDs, you have to pay in dollars. If you are British and the share goes up, but GBPUSD goes down, you are no better off. This denomination exercise is clearly shown by the different returns on buying, say Lloyds Bank shares in sterling, or the NYSE:LYG ADR. 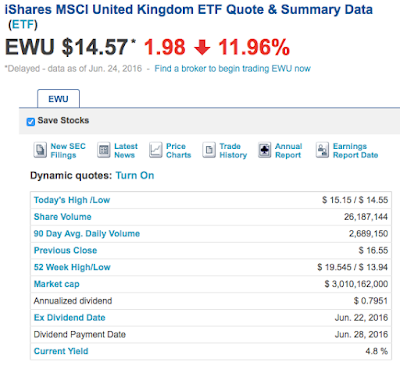 It’s the same company, but like the FTSE and EWU, the latter adjusts for the GBPUSD rate. The ultimate proof of this is NYSE:EWJ, the ETF which track the Nikkei 225. The index itself has swung wildly in the last few years, yet the ETF has followed a neat and orderly sinewave between $11 and $12. This is because most movement in the Nikkei is just a reflection of the value of USDJPY. American investors have therefore very little interest in the index, as there is little prospect of volatility. There is an interesting aside in spreadbetting, a trading method unique to the UK and Australia. Spreadbet brokers offer all their contracts in the local currency, usually in the form of £x per point/pip. They are effectively combining an index with a currency trade, when you buy DAX, you are also effectively selling EURGBP as well, to ensure a consistent return in sterling. This does allow absolute returns, provided you are domiciled in the same currency that you trade in.